The blackened door knocker with its century-old rust marks stands out from the faded blue steel entrance of the Medici Palace in Seravezza. A mixture between a lion’s head and a demon glares at us in a terrifying manner. We step inside and immediately perceive that we are at the centre of former power. Power based on the industry and exploitation of a regional product. Marble. After visiting the palace’s museum, slightly shivering, we leave behind the huge walls casting shadows on the courtyard. A couple years before the palace, meant to be the summer residence of the family, was built, Michelangelo had been commissioned in 1518 by the Medici Pope, Leo X, to search for marble in the mountains around Seravezza. So they could compete with Carrara, he was to build a road to Forte del Marmi, six kilometres away. The stone blocks would then be transported to ships which would head towards Florence. Michelangelo invested three years of his time quarrying the stone meant for the facade of the Medici Basilica, San Lorenzo di Firence. Although he managed the cumbersome task of paving the road through what was then coastal marshes, no one after him ever created the marble facade in Florence. The century-long excavation of the precious material has characterised the Apuane Alps region in Northern Tuscany. Its nearly 2000 metre high, white mountain peaks are so close to the coast that they are initially confusing to the spectator. Snow, south of the Alps and in October? No! It’s the white of the hand-hewn stone that dazzles the eyes. In the quarries, sawmills and stonemason’s workshops, the palazzi and churches, monuments and footpaths, marble accompanies us throughout our journey through this region. Ein paar Jahre vor Grundsteinlegung des als Sommerresidenz der Familie angelegten Palastes hatte Michelangelo 1518 von dem damaligen Medici-Papst Leon dem Zehnten den Auftrag erhalten in den Bergen um Seravezza Marmor zu finden. In Konkurrenz zu Carrara sollte er eine Straße ins sechs Kilometer entfernte Forte dei Marmi bauen, um den Abtransport der weißen Steinquader, der per Schiff Richtung Florenz erfolgte, zu sichern. Drei Jahre investierte Michelangelo in dieses Projekt, um den Stein für die Fassade der Medici–Kirche San Lorenzo di Firenze zu brechen. Doch obwohl es ihm gelang den mühseligen Transportweg durch die damaligen Küstensümpfe zu ebnen, wurde die Marmor Fassade in Florenz niemals realisiert. Jahrhundertelanger Abbau des edlen Steines prägen die Region der apuanischen Alpen in der nördlichen Toskana schon vom Weitem. Mit ihren fast 2000 Meter hohen weißen Bergspitzen, die so nah der Küste sind, wirken sie zunächst irritierend auf den Betrachter. Schnee südlich der Alpen und schon im Oktober? Nein! Es ist das von Menschenhand geschaffene Weiß des Steines, welches uns blendet. In den Steinbrüchen, den Sägewerken und Steinmetzbetrieben, den Palazzi und Kirchen, den Denkmälern und Gehwegsbelagen, überall wird der Marmor zum Begleiter unserer Reise durch diese Region. The starting points of our day trip into the Garfagnana are Seravezza, the city of marble quarrying, and Pietrasanta with its bohemian flair, home to many craftspeople and artists like Botero. The Alfa twists corner after corner, carrying us up the narrow mountain road. We pass the 1589-metre tall Monte Altissimo, Isola Santa and Castel Nuovo di Garfagnana being our goal. Seravezza, die Stadt des Marmorabbaus und Pietrasanta, die mit ihrem bohemen Flair viele Kunsthandwerker, aber auch Künstler wie Botero beherbergt, bilden den Ausgangspunkt unserer Tagestour in die Garfagnana. Kurve um Kurve schrauben wir uns mit dem Alfa die schmale Bergstraße hinauf. Am 1589 Meter hohen Monte Altissimo vorbei, mit Ziel Isola Santa und Castel Nuovo di Garfagnana. It is late October, the vegetation along the way is distinguished by the yellow and red colours that cloak the lime and chestnut trees. Lorenzo, our host at Agritourismo Montebello near Camaiore, not only provided us with many tips but also some fishing rods that now dangle tauntingly over the collapsed roof of our convertible Spider. “The trout bite best at the reservoir in Isola Santa”, he promised us knowingly with an amused smile. A half-abandoned town in front of a spectacular mountain landscape awaits our arrival. The village stretches into the water like a peninsula. The lake, after the construction of the dam in the 70s, had flooded the lower-lying parts of town. The calmness combined with the wind and the sun work the surface of the water, creating reflections of the most varying colours. We make a guess as to why the name Isola Santa - holy island - came to be. Es ist Ende Oktober, die Vegetation ist bestimmt vom gelb–rötlichen Gewand der Linden– und Kastanienwälder entlang der Strecke. Lorenzo, unser Gastvater im Agritourismo Montebello bei Camaiore hatte uns neben vielen Tipps auch Angeln mitgegeben, die jetzt frech über die Verdeckkappe unseres Spiders baumeln. „Die Forellen beißen gut am Stausee der Isola Santa“, versprach er uns mit wissendem Genießerlächeln. Dort angekommen empfängt uns ein halb verlassenes Dorf vor einem spektakulären Bergpanorama. Wie eine Halbinsel zieht sich das Dorf in den See, der nach Bau des Staudammes in den 70ern sogar den tiefer gelegenen Teil des Dorfes überflutete. Die Ruhe, mit der Wind und Sonne die Wasseroberfläche bearbeiten und Spiegellungen in den verschiedensten Farben hervorrufen, lässt uns erahnen, wie ihr Namensgeber auf Isola Santa – heilige Insel – kam. We cast out our lines and after two and a half hours we have one sizeable trout in our basket. Now on towards Castel Nuovo di Garfagnana, where, under the old city gate we stop off in Andrea’s trattoria “Vecchio Mulino”. Wir werfen unsere Angeln aus und nach zweieinhalb Stunden haben wir immerhin eine stattliche Forelle in unserem Korb. Weiter geht’s in Richtung Castel Nuovo di Garfagnana, wo wir unterhalb des alten Stadttors bei Andrea in seiner Trattoria „Vecchio Mulino“ einkehren. Andrea, the life-sized embodiment of his culinary beliefs and a representative of the “slow-food movement”, welcomes us with the delicacies of his regional suppliers. Apart from the panzanella salad, vegetarian tortillas and the truffled mortadella, the “Greco delle Gaggie”, a sweet wine from Lucca, is what we are particularly fond of. As a result of this, we are in a state of utmost satisfaction when we visit, on our way back to Montebello, the Barga and the Ponte della Maddalena dating from the 11th century. The morning with our hosts Piera and Lorenzo at the Agriturismo „La Cappella“ in Montebello near Camaiore begins as usual under the palm tree in front of the house. Andrea, die fleischgewordene Verkörperung seiner kulinarischen Überzeugungen, empfängt uns – als Vertreter der „Slowfood-Bewegung“ – mit den Köstlichkeiten seiner regionalen Zulieferer. Neben dem Panzanella Salat, den vegetarischen Frittate und der getrüffelten Mortadella, ist es besonders der „Greco delle Gaggie“, ein aus Lucca stammender Süßwein, dem wir zum Abschluss besonders zugetan sind. Als Folge dessen nehmen wir auf dem Heimweg nach Montebello das sehenswerte Barga sowie die aus dem 11. Jahrhundert stammende „Ponte della Maddalena“ nur noch im Zustand größter Zufriedenheit wahr. Der Morgen bei Piera und Lorenzo, unseren Gastgebern im Agritourismus „La Cappella“ in Montebello bei Camaiore, beginnt traditionell unter der Palme vor dem Haupthaus. Since it cooled down dramatically last night, we enjoy our latte macchiato and Piera’s homemade “dolci” in the couple’s kitchen. The wood stove in the room next door, with its multiple chimney system, provides us with a cozy warmth. The authentic antique furnishings and small fetching details like the red embroidered cloth covering the bowl of fresh pasta dough encourage my eyes to wander about the room. We feel welcomed, personal interaction beats pure service. Today Lorenzo will need to process yesterday’s olive harvest with the help of the 84 year old Luciano, using the oil press next door. 30 litres of the finest olive oil can be made from every 100 kilograms of olives, which are taken from around 1500 trees scattered around the Monte Bello area. An arduous endeavour for idealists. Slightly mystified, we watch as the heavy stone passes through the greyish-pink olive pulp with a groaning rattle. A thin film of oil begins to set on the mush after a period of patient watching. Da es sich in der gestrigen Nacht stark abgekühlt hatte, nehmen wir unseren Latte Macchiato mit Pieras selbstgemachten „Dolci“ jedoch in der Wohnküche der beiden zu uns. Der Holzofen aus dem Nebenraum sorgt über ein verzweigtes Kaminzugsystem für wohlige Wärme. Die antike Einrichtung wirkt selbstverständlich, kleine hübsche Details wie das rot bestickte Tuch über der Schüssel mit frischem Nudelteig lassen den Blick im Raum schweifen. Wir fühlen uns aufgenommen, persönliche Ansprache ersetzt puren Service. Für Lorenzo heißt es heute zusammen mit dem 84–jährigen Luciano die Olivenernte des letzten Tages in seiner dem Nebenhaus angegliederten Ölmühle zu verarbeiten. Aus je 100 Kilo Früchten, die den ca. 1500 auf dem Gelände des Montebello verteilten Bäumen abgerungen werden, können ca. 30 Liter feinstes Olivenöl gepresst werden. Ein mühseliges Unterfangen für Idealisten. Mit leichtem Unverständnis sehen wir zu, wie der schwere Mahlstein unter ächzendem Knattern durch den grau rosafarbenen Olivenbrei fährt und sich nach Minuten geduldigen Betrachtens ein dünner Ölfilm auf der Masse absetzt. Only when we’re eating the lunch Piera has put together can we understand why Lorenzo wants to uphold this tradition on the farm. She serves us bruschetta with olive oil, chilli and rosemary and her unmatched ravioli filled with ricotta. It is the authentic, richly flavourful taste, the pride in one’s own product, and maybe even the attempt at refined purity which makes the consumption of this food a special experience. We wistfully leave Montebello and take the coastal road “via Aurelia” in the direction of Liguria. We drive past the nearly deserted beach resorts of Forte del Marmi and Marina di Carara. Here along the coast, autumn has not yet fully set in, so we enjoy the journey from La Spezia to Monterosso al Mare with our convertible roof open. Every corner opens up a new vista of the towns clinging like bird nests to the hillside; Riomaggiore, Manarola, Corniglia and Vernazza all in front of a picture postcard view of the sea. As far as the eye can see, terracing stretches from the top of the mountains all the way to the sea. The reason for this shaping of the landscape is wine cultivation that, next to fishing, has over centuries been the primary source of income in the sparse Cinque Terre. Here where the sea characterises the land, small plots with low yields of fruit still produce a special white wine. Erst zum Mittagessen bei Pieras „Bruschetta“ mit Olivenöl, Chili und Rosmarin und ihren unvergleichlichen mit Ricotta gefüllten Ravioli können wir nachvollziehen, warum Lorenzo mit dieser Tradition des Hofes nicht brechen möchte. Es ist der authentische, vollaromatische Geschmack, der Stolz auf's eigene Produkt, vielleicht sogar die Suche nach unverfälschter Reinheit, die den Verzehr dieser Produkte zum besonderen Erlebnis werden lassen. Wehmütig verlassen wir Montebello und nehmen die Küstenstraße „via Aurelia“ in Richtung Ligurien, vorbei an den jetzt fast ausgestorbenen Strandbädern von Forte dei Marmi und Marina di Carrara. Hier an der Küste hat der Herbst noch nicht vollständig Einzug gehalten und wir genießen es die Strecke von La Spezia nach Monterosso al Mare offen zu fahren. Jede Kurve erschliesst eine neue Sicht auf die wie Vogelnester an den Hängen klebenden Städchen Riomaggiore, Manarola, Corniglia und Vernazza vor einem grandiosen Postkartenpanorama mit Meerblick. Terrassierungen soweit das Auge blicken kann ziehen sich an den Bergkuppen zum Wasser hinab. Grund für diese Formung der Natur ist der Weinanbau, der neben dem Fischfang über Jahrhunderte die bestimmende Einnahmequelle eines kargen Lebens in der Cinque Terre war. Geprägt vom rauen Seeklima, entstehen hier in kleinen Parzellen bei niedrigen Erträgen jedoch immer noch Weißweine von besonderer Charakteristik. uciano Capellini, one of the last working wine producers, meets us in Volastra, above Riomaggiore. Without saying much, he first leads us into his wine cellar, small enough that it could fit in a double garage but with ample room for all the tanks and equipment needed. Like most wine producers of the region, his undertaking is a sideline job with 3000-4000 bottles per year. As we taste his “Sciacchetra”, Luciano becomes more talkative. While we visit his dry room and vineyard, he tells us that it takes “four to eight weeks of air drying the grapes after harvest, at least 21 days of fermentation and multiple filtrations as well as two and a half years storage in steel tanks” until this sweet wine from the Bosco grape develops its fullest flavour. Even those who are willing to pay 50-60 euros for the 500ml bottle numbered by hand will still need persuasion skills to acquire one of the 700 bottles produced per year, when the manufacturer himself only has a few tasting bottles left in the cellar. Riomaggiore is near, so we decide to visit the “Via dell’Amore”, a hiking trail that connects Riomaggiore and Manarola. Now during autumn, the paths are not overfilled with tourists, the temperatures pleasant, and the national park Cinque Terre, a UNESCO World Heritage Site, shows its romantic side as the sun sets into the sea. Luciano Capellini, einer der letzten aktiven Weinbauern, empfängt uns in Volastra oberhalb von Riomaggiore. Zunächst wortkarg führt er uns in seinen Weinkeller, der mit allen Tanks und Gerätschaften bequem in einer Doppelgarage Platz fände. Wie die meisten Weinbauern der Gegend produziert er seinen Wein im Nebenerwerb bei einem Volumen von 3000-4000 Flaschen per anno. Bei der Verkostung seines „Sciacchetrà“ wird Luciano redseeliger. Während wir seinen Trockenraum und den Weinberg besuchen, hören wir von "vier bis acht Wochen Lufttrocknung der Trauben nach der Ernte, von 21 Tagen Gärung und mehrfachen Filtergängen sowie einer zweieinhalb-jährigen Lagerung in Stahltanks “bis dieser Süßwein aus der Bosco–Traube sein volles Aroma entfaltet". Doch selbst demjenigen, der bereit ist die 50-60 Euro für das handnummerierte 500ml-Fläschchen aufzubringen, wird es Überredungskunst kosten eine der 700 jährlich produzierten Flaschen zu ergattern, wo selbst sein Hersteller nur noch ein paar Degustationssflaschen im Keller lagert. Riomaggiore ist nah und so beschließen wir noch die “via dell`amore“, einen Wanderweg, der Riomaggiore mit Manarola verbindet, kennenzulernen. Jetzt im Herbst sind die Wege nicht überfüllt mit Touristen, die Temperaturen angenehm und der von der Unesco als Weltkulturerbe anerkannte Nationalpark Cinque terre zeigt sich beim abendlichen Sonneuntergang im Meer von seiner romantischsten Seite. Sestri Levante welcomes us with a summery 26 ºC on the 2nd of November. In the afternoon, the Baia delle Favole, a shoreline promenade with picturesque curvy stone pines, is busy strolling couples and elderly people, while the youth are interested in Sestri’s newest attraction. Sestri Levante empfängt uns mit sommerlichen 26 Grad Celsius am 2.November. Die Uferpromenade der Baia delle Favole mit ihren kunstvoll geschwungenen Schirmpinien füllt sich nachmittags mit schlendernden Pärchen und älteren Leuten, während die Jugend sich der neuesten Attraktion Sestri's widmet. 50 metres down the immense beach, a figure skating rink has been installed directly into the sand. “You’re always looking for what you don’t yet have” seems to be the motto, and now six to sixteen-year-olds romp around the ice with wobbly legs. Amused, parents help their kids into ultramarine-coloured skates or stand around the edge and animatedly comment on the lively goings-on. The man renting skates shakes his head with a smile when I foolishly ask for a pair of size 47 skates. The last sun worshippers as well as Milanese day-trippers are drawn to the beach Baia del Silencio, less than a kilometre south. 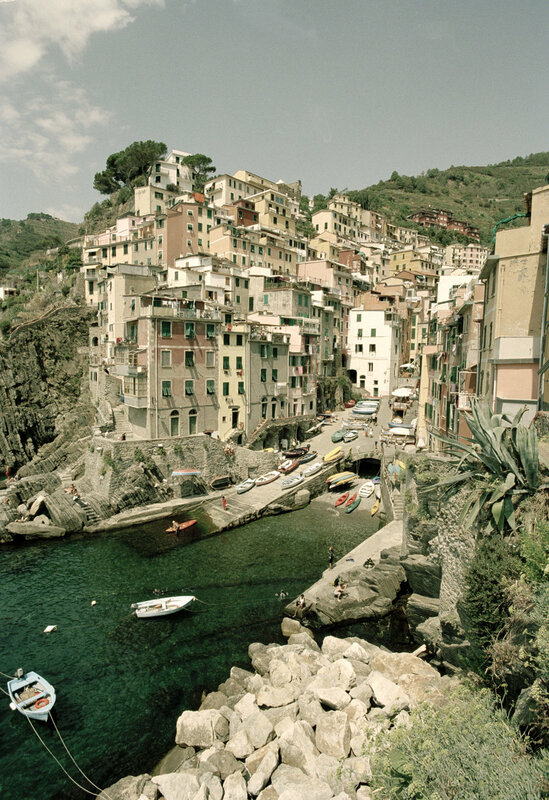 The warm-coloured facades of the palazzi stretch down to the beach and along the bay. The picture-perfect Italian panorama is completed by the slightly raised peninsula of Sestri, with the imposing sight of the Gran-Hotel „i Castelli“ . We can’t get enough of it and admire the view for hours from the beach café “Citto Beach”. The afternoon sun pleasantly warms our necks, and blue shadows dance on the brilliantly white sugar packets next to my latte macciato. The bright light makes even eyes behind sunglasses blink as stylishly clothed locals at neighbouring tables are occasionally observed and an eye is kept out for the friendly waitress. We are happy in the here and now. Fünfzig Meter den weitläufigen Strand hinab, wurde eine Eiskunstlaufbahn mitten im Sand installiert. Nach dem Motto „Man sucht immer das, was man selber nicht hat“ tummeln sich die Sechs- bis Sechzehnjährigen mit wackligen Beinen auf dem Eis. Amüsierte Eltern helfen ihren Kleinen in die ultramarinblauen Stiefel oder kommentieren das bunte Treiben in angeregter Unterhaltung vom Seitenrand aus, während der Schuhverleiher schmunzelnd abwinkt, als ich Ihn spaßeshalber nach einem Paar in Schuhgröße 47 für mich frage. Die letzten Sonnenanbeter des Jahres sowie die mailänder Tagesausflügler zieht es einen knappen Kilometer südlich an den Strand der Baia del Silenzio. Die Fassaden der in warmen Tönen gehaltenen Palazzi ziehen sich bis an den Strand der Bucht hinab und bilden mit der sich seicht erhöhenden vorgelagerten Halbinsel Sestri's, auf dessen Abschluss das Gran-Hotel „i Castelli“ trohnt, dieses einmalige italientypische Panorama, das wir über Stunden vom Strandcafé “Citto beach“ aus genießen. Wohlig brennt die Nachmittagssonne in unserem Nacken, blaue Schatten spielen mit dem weiß-strahlenden Zuckertütchen am Latte-Macchiato-Glas. Blinzelnde Augenlieder trotz Sonnenbrille, gelegentliches observieren der Nachbartische und derer modisch gekleideter Einheimischer wechseln mit wiederholter Suche nach der freundlichen Kellnerin. Zufriedenheit im Hier und Jetzt. Only later in the evening as we eat our second fish course “risotto al nero di sepia” in the restaurant “Rezzano” do we realise by our glowing cheeks how peaceful our afternoon in Sestri had really been. Erst viel später am Abend beim zweiten Fischgang “Risotto al Nero di Seppia“ im Restaurant „Rezzano“ merken wir an unseren glühenden Wangen, wie kontemplativ der Nachmittag in Sestri wirklich gewesen war. Emanuele Canevaro di Zoagli, who resembles Ernest Hemmingway with his stature, white beard and sun-tanned face, welcomes us in the garden of his castle „Castello Canevaro“ which had been converted into a Bed & Breakfast. To the right is a view of the sea to Portofino, and whitecaps forming in the Gulf of Tigullio extending far beyond Sestri Levante can be seen to the left. 54 steps separate us from a jump into Zoegli’s small bay, and above us tower the cream-coloured spires of the castle converted in neo-gothic style by Giuseppe Partini in 1880. As I mix snatches of Spanish into our predominately English conversation, the duke switches suavely to Spanish and tells us of his relationship with South America as well as the history of his forefather and founder of the Canevaro Dynasty, Giuseppe. Emanuele Canevaro di Zoagli, der mit seiner Statur und dem weißen Vollbart im sonnengebräunten Gesicht Ähnlichkeit mit Ernest Hemmingway aufweist, empfängt uns im Garten seines zum Bed&Breakfast erweiterten Schlosses „Castello Canevaro“. Meeresblick nach rechts bis Portofino, linker Hand krausen zarte Schaumkronen den Golf von Tigullien bis weit hinter Sestri Levante. 54 Treppenstufen trennen uns von einem Sprung ins Wasser in Zoaglis kleiner Bucht und über uns ragen die gelb-weiß gehaltenen Türme des von Giuseppe Partini 1880 im neogotischen Stil umgebauten Schlosses empor. Als ich in die zunächst Englisch-sprachige Unterhaltung ein paar spanische Brocken einmische, wechselt der Herzog weltmännisch ins Spanische und erzählt uns von seiner Affinität zu Südamerika sowie die Geschichte seines Vorfahren und Begründer der Canevaro-Dynastie, Giuseppe. In 1812, as an eight year old, Giuseppe had signed up on one of the ships departing from Genoa to the New World. After an intense career in Peru, where he held a monopoly over guano sales, he returned to Zoagli a fortunate man where he acquired what is now known as Castello Canevaro. Later, when we saunter through the castle, all the pictures, photos and personal furnishings give the impression that the Canevaro descendants had just stepped out for a moment, leaving us to our shameless curiosity. The next morning we are awoken by the sun rising over Sestri, filtering its rays through the green lattice on the side window of our suite. Through the open balcony doors, the sound of the lapping waves wafts up from the sea and the deep blue sky and endless horizon are reflected in the window pane. From the Art Nouveau paintings right and left of the balcony windows, two life-sized virgins gaze into our still sleepy eyes. Like in many places before, we feel that, as hoped, here in Liguria our convertible car trip turned into a nostalgic journey. Dieser hatte als Achtjähriger 1812 auf einem der von Genua aus in die neue Welt aufbrechenden Schiffe angeheuert. Nach einer steilen Karriere in Peru, wo er das Monopol zur Guano-Gewinnung innehielt, war er Jahre später als vermögender Mann nach Zoagli zurückgekehrt, wobei er das heutige Castello Canevaro erworben hatte. Beim späteren Streifzug durchs Schloss haben wir den Eindruck, dass all die in den Bildern und Fotos sowie sonstigen Details und Einrichtungsgegenständen präsenten Canevaro-Abkömmlinge nur kurz vor die Tür gegangen seien, damit wir uns unserer Neugier nicht schämen müssten. Am nächsten Morgen werden wir geweckt von der über Sestri aufsteigenden Sonne, die sich durch die grünen Spaliere des Seitenfensters unserer Suite zwängt. Das Klatschen der Wellen dringt vom Meer durch die offenen Balkonflügel, ein tiefblauer Himmel spiegelt den unendlichen Horizont in den Fensterscheiben. Zwei lebensgroße Jungfrauen auf den Jugendstilgemälden links und rechts des Balkonfensters blicken uns in die noch schläfrigen Augen und wir spüren, wie schon vielerorts vorher, dass wie erhofft hier in Ligurien sich unser Cabriotrip in eine nostalgische Zeitreise gewandelt hat.